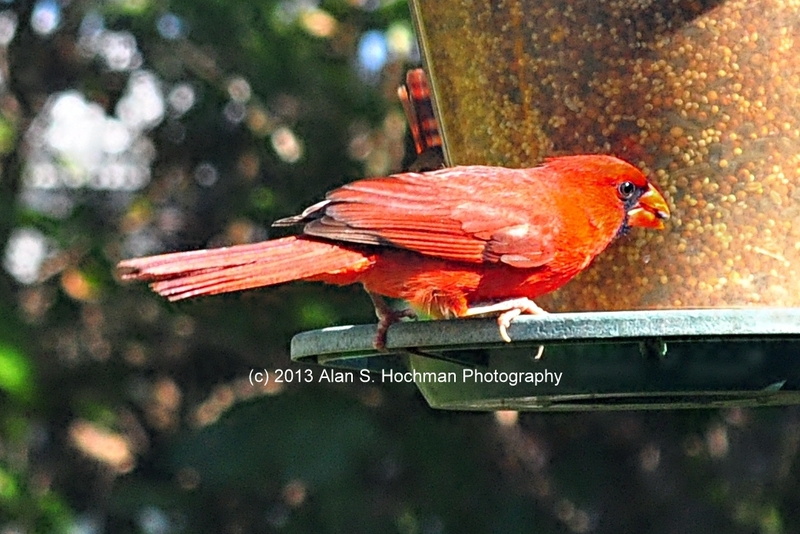 This wildlife photo is of a male Northern Cardinal feeding at a bird feeder on my front porch. The camera gear used for this photo of a male Northern Cardinal was a Nikon D90 attached to a Nikkor 60mm 2.8 lens at a distance of approximately 6 feet. Northern cardinals, also known as “redbirds”, are birds native to North America. In the earlier days, they were most commonly seen in the southeast regions of the United States in warm climates, but can now be found living throughout eastern and central North America, probably due to human habitation and winter bird feeders. They have also been introduced to southern California, Hawaii and Bermuda. These beautiful birds are sexually dimorphic, meaning the male and female look different. Both have a similar shape and both have a crest of feathers on top of their heads. However, the males are bright red with a black mask on their face and the females are light brown with a reddish tinge on their crests, wings and tails. Adults are 8 to 9 inches in length, have a wingspan measuring between 10 to 12 inches and weigh about 1.5 to 1.7 ounces. Females are slightly smaller than males.